Learn Freedman’s Method Ketsugo Jujutsu directly from the founder of the system, Grandmaster Peter Freedman. With our online Skype video lessons, you can enjoy personalized instruction without leaving the comforts of your home. 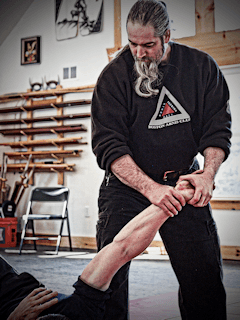 Whether you’re a novice who wants to get a head start or an expert who is looking to rapidly increase his ability to defend against any and all scenarios (weapons, multiple attackers, and unconventional situations) a private lesson with Grandmaster Freedman is something that must be experience firsthand. Book a private appointment today for yourself. Or, book a semi-private for you and your training buddy to participate together. Spots are limited. **Private lessons must be paid in full in order to reserve your spot. ***Please note there are no refunds if you fail to log in and participate during your scheduled, reserved time slot.